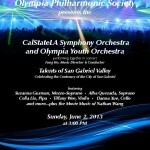 The CalStateLA Symphony Orchestra/Olympia Youth Orchestra will be celebrating the Centenary of the City of San Gabriel in its final concert of the season on Sunday, June 2, 2013 at 3PM at the San Gabriel Mission Playhouse, 320 S Mission drive, San Gabriel, CA 91776. This concert will be FREE to the public. Titled “Talents of San Gabriel Valley”, there will be many soloists performing with the orchestra including 14 year old cellist Danna Xue, 15 year old violinist Tiffany Wee, Pipa virtuoso and recording artist Celia Liu, world renowned mezzo-soprano Suzanna Guzman and broadway star soprano Alba Quezada. The orchestra will also perform works by Smetana and Hollywood composer Nathan Wang in his movie music in sync with video clips on the giant screen. A family concert not to be missed! You are currently browsing the Olympia Philharmonic Society weblog archives for the month May, 2013.